A cellular repeater may be considered as a form of bi-directional amplifier. They will receive a signal from the local base-station and then re-broadcast it locally within the users premises - house, office, etc. The signal transmitted by the cellular handset or user equipment is packed up by the repeater and rebroadcast to the base-station. 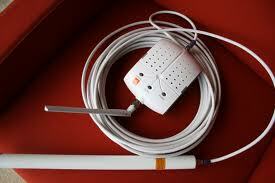 Typically a cellular repeater will utilise an external directional antenna to communicate with the base station. There will then be a down lead to the repeater unit itself which will contain the antenna for radiating the signal within the premises. 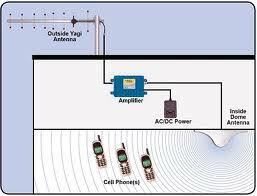 Many simple cellular repeaters only allow use by one cell phone, but others allow the use of multiple phones. In order to reduce cellular interference and congestion, the cellular repeater will transmit and receive on the same frequency.